White Sox catcher Welington Castillo has formally concluded his 80-game PED suspension, but he won’t be going straight from the restricted list onto the active roster. The Chicago organization announced today that the veteran will instead move onto the 10-day disabled list with shoulder inflammation. Castillo, 31, got off to a strong start at the plate this year after inking a two-year, $15MM contract early last winter. He was producing at a .267/.309/.466 clip with six home runs in 123 plate appearances when news broke of his positive test for erythopoieton, a substance prohibited under the MLB-MLBPA Joint Drug Agreement. Though he had played in five rehab games prior to the conclusion of his suspension, Castillo is evidently not ready to return to the majors. It’s not clear at this point how long he’ll be down, but any minute chance of a late-August trade can assuredly be ruled out. In his absence, the White Sox have relied upon Omar Narvaez and Kevan Smith behind the plate. The former has been quite impressive with the bat, improving upon his solid numbers entering the year with an under-the-radar breakout season. He’s hitting at a .280/.374/.435 clip with an impressive 41:30 K/BB ratio in 240 plate appearances. Presumably, Castillo will share time with Narvaez when this DL stint is over. But it stands to reason that the organization will want to get a long look at the younger, more controllable player. It’s certainly possible that Castillo will end up as trade fodder at some point, but it’s also worth bearing in mind that the South Siders could see the ensuing offseason as an opportune time to make some roster improvements in hopes of challenging in a division that has easily been the worst in baseball in 2018. Hanging onto Castillo, rather than trying to move him after a messy campaign, may well be the most sensible approach. TODAY: Castillo has officially been suspended after testing positive for banned performance-enhancer Erythopoieton, per a league announcement. YESTERDAY: White Sox catcher Welington Castillo has been slapped with an 80-game suspension following a failed PED test, per Dominican journalist Americo Celado. Ken Rosenthal of The Athletic tweets the same, and it seems that an announcement from the league could come tomorrow. Castillo, 31, signed a two-year, $15MM contract with the White Sox in the offseason and will forfeit nearly half of his $7.25MM salary on the 2018 season as a result of the 80-game ban. For the time being, it seems likely that Omar Narvaez will step up as the team’s primary catcher, though the Sox will need to make another move to add a backup to the equation. Kevan Smith could conceivably be an option eventually, though The Athletic’s James Fegan tweets that he was just placed on the disabled list yesterday. Chicago doesn’t have another catcher on its 40-man roster, so it could have to select either Alfredo Gonzalez or Brett Austin from Triple-A Charlotte. Blake Swihart figures to draw his fair share of speculation in connection with the ChiSox, as the agent for the seldom-used Boston backstop recently requested that the Red Sox trade his client. Looking to the waiver wire, the A’s designated Dustin Garneau for assignment yesterday, and he could be a quick fix to at least give the White Sox another option behind the plate while Smith mends. Though the Sox are just 14-31 on the season, it’s a tough loss for the team all the same. Castillo got off to a fine start this season, hitting .270/.314/.477 with six homers through his first 32 games and 118 trips to the plate. He’s done a good job of controlling the running game (32 percent caught-stealing rate), as well. Castillo, of course, becomes the second prominent player in the past week to be hit with an 80-game ban for a failed PED test. Robinson Cano tested positive for a banned diuretic that acts as a masking agent to performance-enhancing substances last week. Rosenthal notes that Castillo tested positive for a banned substance but not directly for a steroid, so it seems possible that he had a similar substance to that of Cano in his bloodstream at the time of the test. “I see as much young talent here as I’ve ever seen anywhere,” White Sox catcher Welington Castillo told Steve Greenberg of the Chicago Sun-Times about his new team’s spring camp, and that includes Castillo’s previous stint on the north side of Chicago. “In 2013, when I was with the Cubs, we weren’t even close to what we’ve got here,’’ Castillo said. ‘‘In 2014, [the Cubs] started changing; you started to see more about the big prospects. But they still weren’t really coming to the big leagues. The White Sox, our prospects are already here, and they’re building together. This organization is still a step ahead of the Cubs [in 2014].” It remains to be seen if the current Sox core can possibly match up with what the Cubs have accomplished over the last three seasons, though given the amount of top-tier young players the White Sox have acquired in their rebuild, there is no shortage of promise for a quick return to contention for the franchise. Both Jose Abreu and Kevan Smith made early exits from today’s Cactus League game with the Rangers, as MLB.com’s Alyson Footer and others reported. Left hamstring tightness forced Abreu out of the game after two innings, while Smith suffered a left ankle sprain in the fifth inning. More will be known about both injuries tomorrow, though manager Rick Renteria doesn’t believe either issue is particularly serious. X-rays on Smith’s ankle already came back negative, yet any missed time could hurt the catcher in his battle with Omar Narvaez for the backup catcher’s job behind Castillo. Abreu’s roster spot obviously isn’t in question, though any type of injury to their best hitter is worrisome for the White Sox. Renteria hinted that Hector Santiago may have won himself a 25-man roster spot, telling The Athletic’s James Fegan (Twitter link) and other reporters that he likes to use a left-hander (like Santiago) in relief of a right-handed starter, and noted Santiago’s ability to provide multiple innings out of the pen. Chicago signed several veteran relievers to minor league deals this winter, though Santiago is standing out from the competition with excellent spring numbers, posting an 0.75 ERA over his first 12 innings. Santiago’s minors contract with the White Sox will pay him $2MM should he crack the Major League roster. Matt Davidson is “not paying attention to anything else other than really my contact rate” this spring, the third baseman tells James Fegan of The Athletic (subscription required). Davidson hit 26 homers in 443 PA last season, but contributed little else besides that pure power, with an overall .220/.260/.452 slash line and a whopping 165 strikeouts against just 19 walks. Davidson knows he has to become a more well-rounded player in order to stick with the Sox given the strong competition for jobs in camp and during the regular season. The White Sox announced on Friday that they’ve signed free agent catcher Welington Castillo to a two-year contract. One of the few teams to disclose financial terms, the White Sox confirmed previous reports that Castillo signed a two-year, $15MM contract with an $8MM club option for the 2020 season. He’ll earn $7.25MM in each season and is promised another $500K through a buyout. Castillo is represented by ACES. The 30-year-old Castillo is coming off one of the best seasons of his career, having batted .282/.323/.490 with 20 homers in 365 plate appearances as the Orioles’ primary backstop. With that strong offensive output in his back pocket, Castillo turned down a $7MM player option to return to Baltimore — a move that has certainly paid dividends now that he has a multi-year agreement secured. While Castillo has long come with a questionable defensive reputation, he led the Majors with a 49 percent caught-stealing rate in Baltimore and also turned in dramatically improved pitch-framing marks in his lone season with the O’s. It remains to be seen if he can sustain that level of defensive play moving forward, but the improvements certainly didn’t hamper his free agent stock. Though the White Sox are (obviously) in the midst of a rebuild, the team has relied on a hodgepodge of underwhelming options since making the error of non-tendering Tyler Flowers prior to the 2016 season. Castillo will help to solidify a position of need and also give the team’s up-and-coming core of young pitchers an experienced receiver behind the dish. With Castillo in the fold, Omar Narvaez will shift from the club’s starting catcher to a reserve role, while Kevan Smith will likely be pushed off the big league roster. That pair received the majority of the White Sox’ at-bats behind the plate last season, with Geovany Soto and Rob Brantly also receiving a handful of opportunities. Overall, the South Siders’ catching corps posted a solid .279/.346/.381 batting line, though Narvaez and Smith both benefited from some help in the BABIP department, and neither offers anywhere near the pop that Castillo carries in his bat. From a payroll vantage point, the Sox can easily fit Castillo’s salary onto the books. The Sox entered the offseason projected to field just a $61MM payroll (after arbitration estimates), with only $15.95MM of that sum coming in the form of guaranteed contracts. The only guaranteed money on the books beyond the 2018 season is Tim Anderson’s contract, which calls for just a $1.4MM salary in 2019. Castillo may or may not fit into the expected competitive window on the south side of Chicago; the Sox aren’t expected to make an aggressive push for contention this season, though they surely like the idea of a veteran catcher helping a young pitching staff all the same. However, given the wealth of talent in the upper levels of the Sox’ farm, it’s not out of the question that they could contend as soon as the 2019 campaign — the second year of Castillo’s deal. If not, the team surely aims to be contending by 2020, and if Castillo’s play still merits an $8MM salary at that juncture, he could yet be leaned upon as part of the puzzle, depending on the development of prospect Zack Collins. If the Sox ultimately need a bit longer to return to prominence, or if Collins ascends and pushes Castillo for the regular role, his contract is modest enough that it should contain some trade value on the open market, provided he continues to produce at a level similar to his 2017 form. Ken Rosenthal of The Athletic reported the agreement (Twitter links). Jeff Passan of Yahoo Sports reported the terms of the deal (Twitter link). Jon Heyman of Fan Rag tweeted the annual breakdown. Orioles manager Buck Showalter joined Jason La Canfora and Jerry Coleman on the B-More Opinionated podcast to discuss his team’s 2017 struggles, the upcoming offseason and the many roster decisions facing the club. Among the many topics discussed were the team’s catching situation, Showalter’s thoughts on a number of up and coming prospects in an improved Orioles system and the importance of improving the organization’s development of young pitching. Showalter quickly dismissed any notion that the team couldn’t compete with larger-market clubs for top-tier free-agent pitchers, calling it an “excuse” and emphasizing that the O’s need to develop their own pitchers more effectively. “Whether it’s [Kevin] Gausman, [Dylan] Bundy, [Hunter] Harvey — we’ve got to be about eight or nine [starters] deep,” said Showalter. Asked about Double-A right-hander David Hess, Showalter suggested that the 24-year-old could be a factor for the O’s at some point next season, noting a tendency to get stronger and improve as the season wears on. Showalter also candidly acknowledged the sting that’s felt from trading away some young arms (e.g. Zach Davies, Parker Bridwell) but dismissed the suggestions that there’s tension between him and general manager Dan Duquette. Showalter also heaped praise on several minor leaguers, including Hess, catcher Austin Wynns, infielder Steve Wilkerson, and outfielders Cedric Mullins, DJ Stewart and Austin Hays (the latter of whom made his MLB debut with the O’s in 2017). Showalter sounded particularly bullish on Mullins’ glove in center field and Wynns’ ability to help out behind the plate if needed, listing him right alongside top prospect Chance Sisco and stating that he “[doesn’t] spend a lot of time separating them” when thinking about the ways in which they can help the team down the stretch. Wynns, Showalter opines, is often overlooked because he’s 26 years of age and was a senior sign out of the draft, but the skipper sounded highly encouraged by his development. Both Wynns and Hess are candidates to be added to the 40-man roster as Rule 5 eligible players, and while Showalter noted it’s not his decision, his preferences on the pair seem rather clear. Showalter told La Canfora and Coleman that he hoped the front office would bring back his entire coaching staff in 2018, and MASNsports.com’s Roch Kubatko reports that that will indeed be the case. Per Kubatko, the entire coaching staff has been extended an offer to return next season. Kubatko notes that first-year pitching coach Roger McDowell was a popular target for criticism in Baltimore thanks to the rotation’s struggles, but Kubatko notes that several pitchers on the Orioles’ pitching staff have campaigned for the return of McDowell, who has a long track record as a successful pitching coach at the Major League level. Jon Meoli of the Baltimore Sun takes a look at the Orioles’ catching depth with the likely departure of Welington Castillo this offseason, noting that Baltimore can lean heavily on the combination of Sisco, Caleb Joseph and Wynns, the latter of whom Meoli lists as a candidate to be added to the 40-man roster (as Showalter suggested). Meoli notes that veteran minor league backstops Francisco Pena and Audry Perez are likely to test the waters of minor league free agency this offseason, making the potential addition of Wynns seem all the more plausible, on paper. It’s worth noting that Showalter did tell La Canfora and Coleman that he hopes Castillo “will find his way back to us,” and Meoli notes that there were no readily apparent concerns about his framing or game-calling abilities among the Orioles’ pitching staff in ’17. Nonetheless, it seems quite likely that Castillo, who slashed .282/.323/.490 with 20 homers and an MLB-best 49 percent caught-stealing rate, will seek a greater deal than his $7MM player option in 2018. There was a “legitimate possibility” of the Orioles exercising Wade Miley’s $12MM club option for the 2018 season before a late collapse, writes Eduardo A. Encina of the Baltimore Sun, but the team now looks likely to buy that option out for $500K. Baltimore will be on the hunt for a left-handed starter this winter, but as Encina points out, the free-agent market is hardly rife with appealing options. Most of the lefties available are reclamation projects or back-of-the-rotation starters, with 35-year-old Jason Vargas and 37-year-old CC Sabathia representing the southpaws that enjoyed the most success in 2017. Encina notes that the weak crop of lefty starters may force the O’s to really evaluate whether they’d like to “balance” out their all-right-handed rotation or simply set their sights on overall quality regardless of handedness. Of course, it should be noted that even the offseason crop of right-handed starters carries more question marks than sure things, and the O’s will need to add a minimum of two starters. Suffice it to say, GM Dan Duquette will have his work cut out for him. The O’s don’t look likely to make any significant additions to their lineup, writes Roch Kubatko of MASNsports.com. Catcher Welington Castillo is expected to decline his modest $7MM player option on the heels of a terrific all-around season, but Baltimore may simply hand catching duties over to top prospect Chance Sisco and Caleb Joseph. In the outfield, Adam Jones will return in center field, with Trey Mancini and young Austin Hays the favorites to work in the corners. (Mark Trumbo, then, would be the DH.) However, Kubatko does note that Hays, a 2016 third-rounder who skyrocketed through the system, won’t merely be handed a job. Inferring a bit, that’d suggest that the O’s could add a veteran outfield option to push Hays and possibly handle some corner work early in the year of Hays proves to need more development time. While the Orioles’ farm has long been ranked among the bottom minor league systems in the game, they’ve made some significant progress in that regard as of late, writes MASNsports.com’s Steve Melewski. Melewski spoke to MLB.com’s Jim Callis and both J.J. Cooper and John Manuel of Baseball America in recent weeks, with each suggesting that the Orioles now rate more as a middle-of-the-pack farm (in the 15 to 20 range throughout MLB). The improvements come largely based on Hays’ breakout and the presence of Sisco, both of whom will likely exhaust their rookie status early in the 2018 season. But 2017 first-rounder DL Hall, 2015 supplemental rounder Ryan Mountcastle and a once-again healthy Hunter Harvey have helped bolster the top end of the farm for the time being. There’s still a lack of pitching help in the upper levels, however — an element that is particularly troublesome given the current state of the big league roster. Eugenio Suarez is “open for everything” in terms of discussing an extension with the Reds, MLB.com’s Mark Sheldon reports. Suarez will be eligible for arbitration for the first time this winter, though he’s still focused on the season and not on the numbers. “I don’t think about how much I want. I just want to sign with this team. I don’t want hesitation or arbitration,” Suarez said. The third baseman is in line for a very nice payday in the wake of a breakout season that saw him hit .265/.374/.476 with a career-best 26 home runs. As Sheldon notes, the Reds just signed Tucker Barnhart (another player about to enter arbitration eligibility) to a long-term deal, and Suarez certainly makes sense as an extension candidate this winter. MLBTR’s Jeff Todd recently opined that Suarez’s future with the team could be at shortstop, should Zack Cozart leave in free agency and third base prospect Nick Senzel forces his way into the big league lineup in 2018. 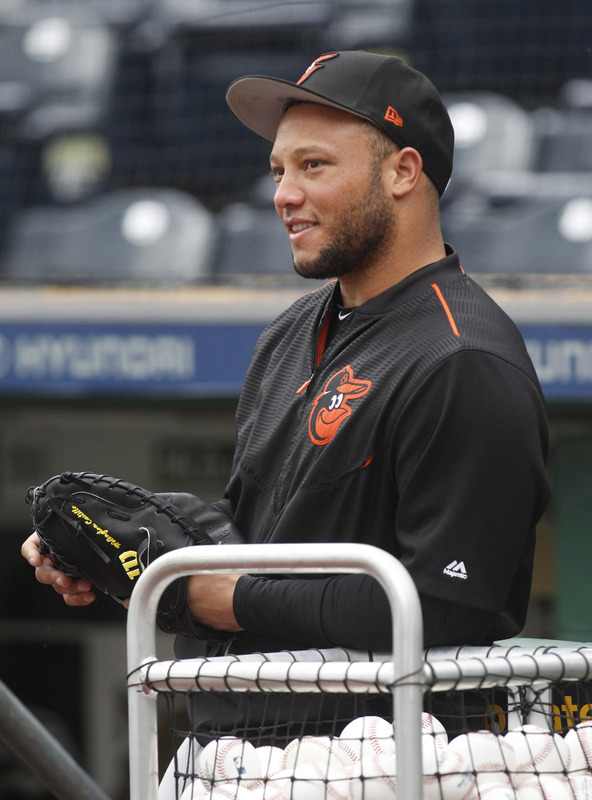 Welington Castillo is concentrating on playing and tells Eduardo A. Encina of the Baltimore Sun that he has yet to consider the player option decision facing him after the season. The catcher did say, however, that he enjoys playing in Baltimore and wants to remain with the Orioles. Castillo controls his own fate in the form of his $7MM option for 2018, though given his impressive numbers this year, he is likely to find a much richer long-term deal by testing the free agent market. From the perspective of Orioles executive VP of baseball operations Dan Duquette, the team would be happy to have Castillo back but the O’s also have catching depth in the form of Caleb Joseph and top prospect Chance Sisco. “Either way is helpful to the club,” Duquette said. Steve Pearce has been shut down for the season due to a bad back, Sportsnet.ca’s Ben Nicholson-Smith reports. Pearce will receive epidural injections next week in order to hopefully solve the back soreness that has bothered him for much of the season. Pearce will conclude his first season with the Blue Jays with a .252/.319/.438 slash line and 13 homers in 348 PA, as he was limited to 92 games due to the back problem and a month-long DL stint due to a calf strain. Left-hander Shawn Morimando has been sent home by the Indians due to a rather unusual reason — the team simply can’t find any innings for him, Paul Hoynes of the Cleveland Plain Dealer reports. Morimando was promoted on September 1 since the Tribe wanted extra pitching on hand for a double-header, but Morimando had yet to make an appearance over three weeks into his call-up. Morimando will still receive service time and pay for the remainder of the year. The 24-year-old does have some MLB experience on his resume, appearing in two games (4 2/3 IP) for Cleveland in 2016. The Red Sox have been getting Blake Swihart experience at first base, and he’s also been taking grounders at third base, writes Peter Abraham of the Boston Globe. Boston also plans to send the 25-year-old former top prospect to winter ball this year, which will allow him to make up for some missed time (due to injuries) but could also boost his trade value by showcasing some versatility. The switch-hitting Swihart was long touted as Boston’s catcher of the future, but Christian Vazquez and Sandy Leon look locked in for the 2018 season, when Swihart will be out of minor league options. “We recognize where he’s at contractually going into next year,” manager John Farrell tells Abraham. “Trying to create some versatility on the defensive side of things is part of the overall plan.” Swihart’s surgically repaired ankle has still limited him this year, so the extra time in winter ball could prove especially important as the Sox make a determination on his future. The Yankees are turning to Jordan Montgomery with the fifth spot in their rotation this time around — not veteran trade acquisition Jaime Garcia, writes Dan Martin of the New York Post. It’s not a long-term move, per manager Joe Girardi, who notes that Garcia will be plugged back into the rotation sometime during the next turn. Nonetheless, it’s a disappointing outcome for a Yankees club that parted with a pair of minor league arms (Zack Littell and Dietrich Enns) to acquire Garcia. The veteran hasn’t lasted more than 5 1/3 innings in any of his starts for the Yankees, though, as Martin points out. Welington Castillo’s scorching bat is helping to keep the Orioles in the Wild Card race, and manager Buck Showalter spoke to reporters about how the backstop has met, if not exceeded expectations this past spring (via MLB.com’s Brittany Ghiroli). “He had that potential,” said Showalter. “I told you from the first day. I wasn’t that knowledgeable other than talking to people, people who I respect their opinion, watching some tape. Until you get someone, especially a catcher, he’s been so easy to work with. … He’s getting a good return for the way he’s approached this season, and so are we.” Castillo is hitting a ridiculous .376/.410/.688 with 10 homers since the All-Star break. Of course, Castillo could also be playing himself either out of the long-term picture for the Orioles or at least into a considerably larger contract with them. Given his recent surge at the plate, his cumulative .300/.339/.512 batting line and his career-best/league-leading 50 percent caught-stealing rate (22-for-44), I find it difficult to imagine Castillo exercising his $7MM player option for the 2018 season. Rather, it seems likely that he’ll enter free agency in search of a considerably larger payday and be able to find just that.